Our nation's talking heads love to blame real world crime on various forms of media. Whether it's sexual video games, poopmouth song lyrics, or violent movies, we're led to believe that junk media creates deviance. But this is far from a new phenomenon. 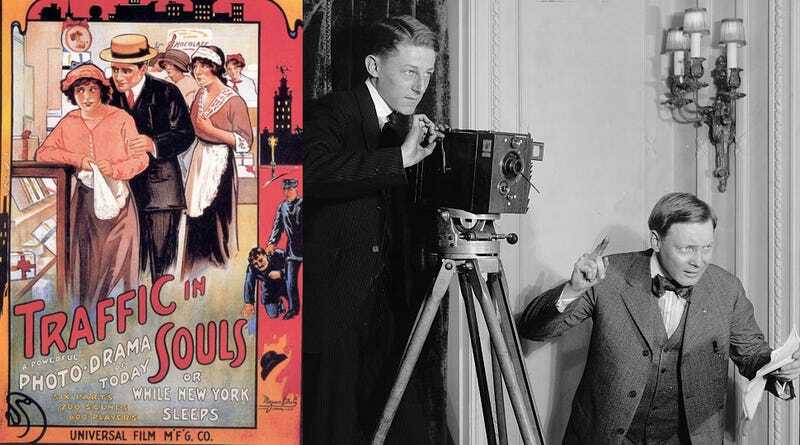 In fact, your great-great grandparents probably heard identical warnings about the new media of their day: Movies. The November 16, 1911 edition of the Marshall Evening Statesman in Michigan ran an article about how moving picture shows were sweeping the country. But it came with a word of warning; specifically, that movies may lead your kids to a life of crime. The newspaper explained that American children were going to see movies by the tens of thousands. But the cheap entrance fees and lack of regulation were posing a problem for people who saw this new medium as a gateway to any number of vices. It is not a rare sight to see boys and girls engaged in mimic "hold-ups" on the street, following all the details of the moving picture shows. Amateur burglars are robb[ing] houses exactly as portrayed by the pictures and one cannot estimate the evil done through mock representations of bloodshed and crime. The Marshall Evening Statesman said that a new committee had been established in New York to look at the problem of movie-inspired vice. New York City alone had seen 720 movie theaters crop up in just a few short years, the newspaper warned. And daily audiences were reaching 250,000 people. "Unmentionable crimes, three: aggravated assault, thirty-two; attempted assaults, six: abductions, three; indecent assaults, three; impairing the morals, fifteen; a total of sixty-two cases on which there were forty convictions and thirty-two offenders committed to state prison." Researchers have been looking at the impact of media on real-world crime for decades. And they have yet to find a strong correlation anywhere, when you adjust for environmental factors. But it seems moral panic has always been in style. So the next time some TV pundit with more jowls than sense starts spouting carbon dioxide about a dangerous new movie or video game or lyric that inspires kids to do horrible things, just imagine they're talking about the Great Train Robbery.